Whatever reactions you want to run, our Bullfrog Batch Reactors are flexible and robust enough to meet your needs. The Bullfrog Batch Reactors are available as single reactors or in high throughput, multiple reactor format and come with a large variety of options and accessories to meet your requirements. Whether you want to evaluate a different reaction every time, or carry out standard tests every day, you�ll be able to select a configuration that suits you. All our batch reactors are simple to use, have a compact footprint and represent excellent value for money. 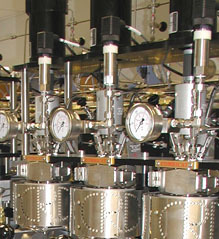 And, of course, our reactors are always fully safety tested and can be certified to meet all relevant legislation.